Why one family commutes four hours daily – across boroughs – to attend the school of their choice. Shadina (center), Sebanya (l) and Te-Banyah(r) all smiles as they pose for photos by HLA’s logo. In Morris Heights, Bronx, the alarm sounds at 4:00 a.m. signaling to Shadina Charles that it is time to wake up and get her daughters ready for school. She begins her daily routine of preparing their lunch and breakfast, which they will have to take to go. At 5:00 a.m. she wakes the girls; they are dressed and out the door by 5:45 a.m. The streets are dark and quiet but with no time to worry or fear, they rush to catch the BX36 bus which will take them to the A train. If they are lucky, they will get a seat so they can eat breakfast and sleep for the next hour until they arrive at their stop, Utica Avenue in Brooklyn. Charles knows she will have to wake them up a few stops ahead of time because they’ll need to hurry to catch the B46 bus, which they will ride for about 30 minutes before they transfer to the B3 bus that will drop them off within two blocks of their destination. By the time they make it to school at Hebrew Language Academy Charter School (HLA) in Mill Basin, Brooklyn it is just about 8:00 a.m. and time for class to start. Charles will head back to the Bronx and try to take a nap for an hour or so until it’s time to get the girls when school lets out at 3:00 p.m. Some days, if the weather is really bad or school is only half day she will hang out in Brooklyn – most times at the mall – until school is dismissed. By the time she gets them home, it’s just about 6:15 p.m., time to eat, finish the homework they started on the train, head to bed at 9:00 p.m. and get ready to do it all again the following day. Though the commute to school from the Bronx to Brooklyn may be arduous, for the family, school is the one source of stability they have come to count on over the last five years. 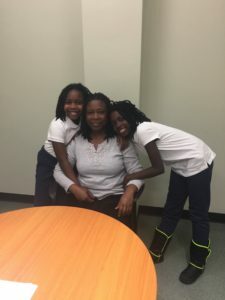 Through sickness, homelessness and constantly moving from place to place, the choice to stay in the school they have been in since kindergarten allows Charles to offer her daughters a sense of stability and comfort. Additionally, in a school as racially and socioeconomically diverse as HLA, the girls benefit from being in an integrated environment, much unlike the majority minority neighborhoods they have mostly resided in. Jon Rosenberg, president and CEO of Hebrew Public, the charter management organization for HLA, said given the academic benefits of learning in diverse classrooms, every child should be afforded this right. For these reasons, safety and environment are key factors in school choice for Charles. She firmly believes the public schools they would have otherwise been mandated to attend, were just not a suitable option. In fact, in an education news climate now saturated with commentary surrounding school choice, she believes, the voices that matter – the parents and the students – are often drowned out by the experts and the lawmakers. Back in 2011 when Charles first received a flier in the mail from HLA advertising open registration, she had just migrated to the US with her four daughters only a year before and had no idea what a charter school was. At the time her daughter, Sebanyah was in pre-k at the zoned public school in Mill Basin where they lived. Each time she went to pick her up, she was unnerved by the excessive noise and chaos that seemed to be the method of operation during the school’s activities. However, Charles knew private school was hardly an option for her financially. As such, it was a great relief to her to find out that at the new charter school, which is privately run but publicly funded, she wouldn’t have to pay but could still get the benefits of private school in a more controlled and intimate environment. “When I got the letter she was accepted, I was so overjoyed and I haven’t regretted it since,” Charles said. Naturally, when her youngest daughter Te’Banyah was ready for kindergarten in 2014, the choice was already made. She credits the principal and teachers for being caring and warm. She’s become good friends with the girls’ science teacher, Ms. Kelly and has a friendly rapport with everyone – from the office staff to the security. Security and safety is a necessary component in their ever-changing world. In 2011, Charles was diagnosed with lymphoma, a form of cancer affecting the immune system. By then, the family had moved out of the school district and were living in the Brownsville neighborhood of Brooklyn. In fact, they had relocated so many times since then, that Charles has lost count. But now that she was undergoing chemo treatments, she lost her job as a nanny and was unable to keep her apartment. With no family to turn to, she went to the Department of Homeless Services (DHS) office to find them a place to stay. They were assigned to a family shelter in the Bronx. Life in the shelter, though not ideal, was bearable. They were placed in an apartment with their own kitchen and private amenities and so the family was able to maintain some sort of normalcy. One of her older daughters was able to take the girls back and forth to school until she was well enough, but she recalls that due to her illness, they missed many days of school. Michelle Galeotti, director of Operations at HLA, when the school became aware of the family’s situation, they tried to work with DHS to get them placed closer to the district. “Shadina and her girls are truly a part of the HLA family. When they were placed in the Bronx, we did everything possible to move them closer to our area but that was the only place that could accommodate the family together,” Galeotti said. Eventually, Charles was able to secure a job as a housekeeper, cleaning apartments for Air Bnb. She worked long hours, from 4:00a.m. to 12:00a.m. and never saw her children. The payoff came nine months later when she managed to save enough money to move back into her own apartment in Crown Heights, Brooklyn and for a while everything seemed to be going well. But in February of 2015, while walking down a street in Brooklyn, she was hit by a car, which resulted in seven surgeries on her left leg. Consequently, she lost her job, then her apartment and found herself back in the DHS office looking for place for them to live. She was once again re-assigned to another shelter in the Bronx. Though her older daughters provide her with much needed support for the girls, at times when they were unavailable, Charles remembers the painstaking ordeal of walking on crutches, while making the commute from the Bronx to Brooklyn to take the girls to school. Charles knows firsthand the effects of an unstable home-life on a child’s academic performance. In Grenada where she grew up – though she has fond memories of her childhood, playing in the country’s pastures – she remembers days when they barely had food to eat. As a result, she never did well academically and was most times absent. Eventually, she dropped out. In her adult years, Charles later returned to school to complete an adult education certification program where she graduated at the top of her class. She had dreams of becoming a social worker but, at that point, with four daughters and little education, her dream was put on hold. Though she held several different jobs while living in Grenada, she still was not financially stable and, at home, life with the father of her children had become tumultuous and difficult to bear. She had visited the US a few times before and had set her sights on migrating there in hopes of securing a better life for her children. By then, her oldest daughter was already an adult, the second a teenager and Sebanyah and Te’Banyah just babies. “I told them, I’m taking you all to the US and there is no guarantee I am going to return.” Charles said the girls protested initially, but she refused to leave them behind. Being raised by her grandparents – her mother left her at just a year old and she didn’t meet her dad until age nine – separation from her children was not something she could imagine. Despite all the hardships she’s had to endure, that has remained her ultimate goal. She was finally able to move out of the shelter with the help of CITY-FEPS, a rent subsidized program that helps families with homeless to find permanent housing. 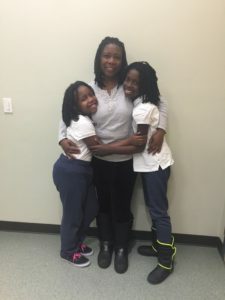 The family was placed in a one-bedroom apartment in Morris Heights and Charles said, the girls were just elated to be back in a place of their own. However, these days, severe bouts of acute bronchitis and her injured leg have so incapacitated her, that she is unable to continue working as a housekeeper. And, with the financial constraints that being unemployed brings, she often finds herself worried about whether she is doing enough. “I do my best to provide their needs and some of their wants. On days when we don’t have enough food, I make sure they eat and I go without,” she said wistfully. Yet, as a testament to her perseverance, the girls are thriving at HLA. Sebanyah, now in fifth grade, has dreams of being an international fashion designer and has many books filled with sketches of high end dresses she hopes to one-day design for celebrities. Te’Banyah who is in the second grade is still figuring it out. Though the commute is long, Charles doesn’t believe it has had any negative impact on her children’s academic performance. Charles said the school offered her bus service for the girls when they first became homeless, but she refused because she did not feel comfortable sending two small girls on a bus alone. In fact, to keep them motivated, she jokes that she often threatens to move them to another school if they do not keep their grades up. “I just use it to scare them a little, it works,” she said with a laugh. Truth is, she couldn’t imagine moving them. 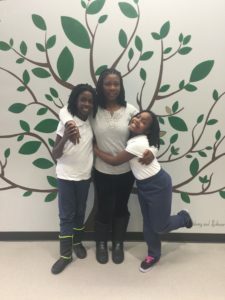 She was more than relieved to find out that under the law she could keep her children in the same school they were in, even though when they became homeless they moved out of the district. The Mckinney-Vento act, which guarantees certain protections for homeless students, stipulates that students must be allowed the right to remain in the district they were originally in, if the parent believes it is in the best interest of the child. “If I found out I had to move them, I’d probably home school them,” she said determinedly. In fact, her dream is that HLA will eventually grow into a high school when the time comes but, if not, she is eyeing Madison High in Sheepshead Bay, Brooklyn and is willing to make the commute from the Bronx even then, just to get them in an environment where they are comfortable.